A call to Thierry Voisin brings confirmation that he's now joined Burgess and Oceanstyle to list the 41m motor yacht Blink for sale. Blink is one of the largest planing flybridge superyachts on the market today. 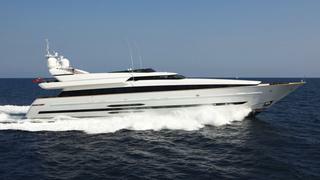 Delivered in July 2009 by Cantieri di Pisa, this “as new” Akhir 135 is in excellent condition and ready to inspect. Blink‘s striking Cristiani Gatto interior provides deluxe accommodation for 11 guests in five cabins, including an impressive full-beam master suite. An elevator connects the main and upper decks and is designed to offer easy wheelchair access. Nominated as a finalist in the 2010 World Superyacht Awards, Blink is a pedigree, high performance yacht which combines the highest standards of construction with refined Italian styling. Lying in Mandelieu, her asking price is €12.5 million.